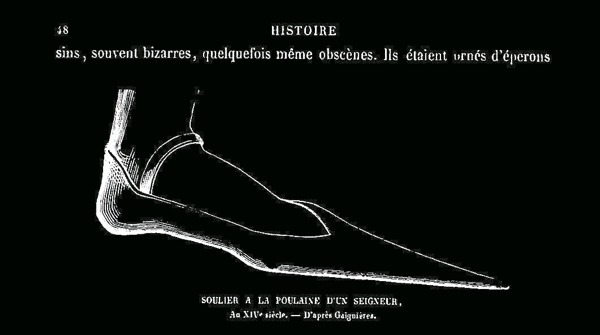 These shoes grew both in favor and length, for a number of years, until the poulaine had reached such proportions that it was necessary to fasten it to the knee by means of a chain of gold or silver, while in order to keep it in shape it had to be stuffed with hay, straw or fine moss. 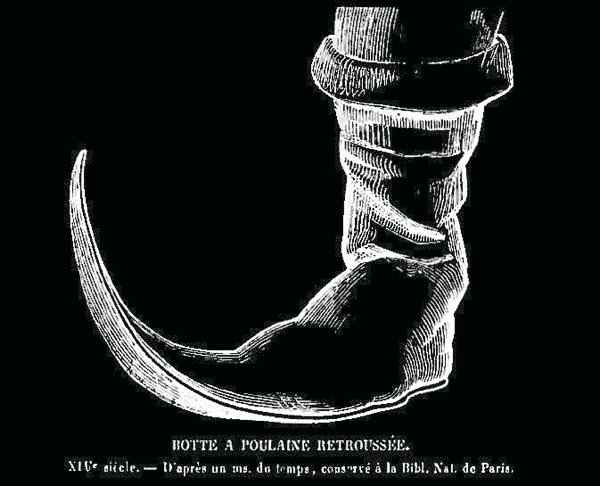 The length of the poulaine was determined in the same manner as the of the chopines, by the rank of the wearer, and it was no uncommon sight to find a nobleman with his poulaine some twelve inches or more in extent, while the upper part of his shoes would be cut out to imitate the windows of a church. This fashion flourished for a long time despite the anathemas of the bishops, who stigmatized them as immoral, and the denunciations of officials. The poulaine lives a second life as they are (were?) 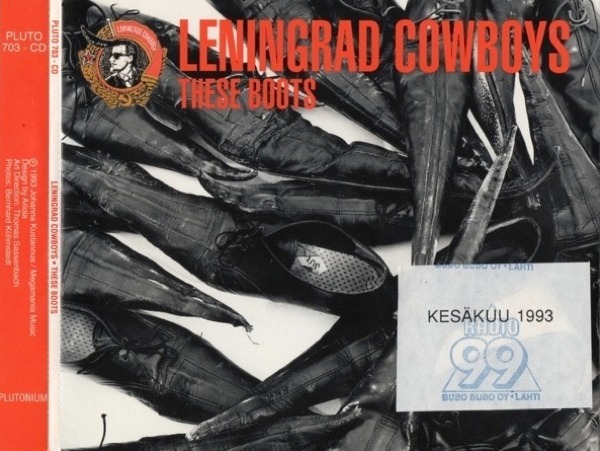 the footwear of choice by a bunch of wodka-fuelled musicians from Finland called Leningrad Cowboys. 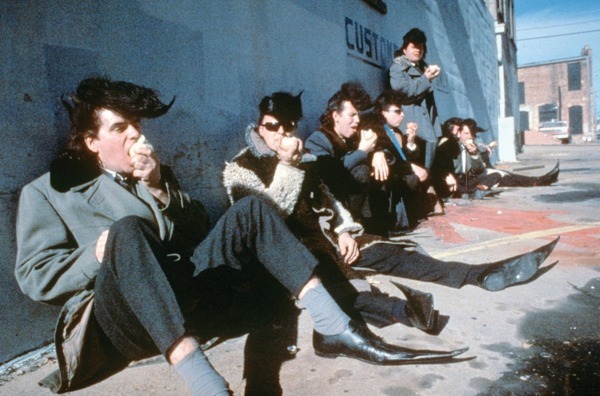 The ONLY footgear available to match their pompadour hairstyle. 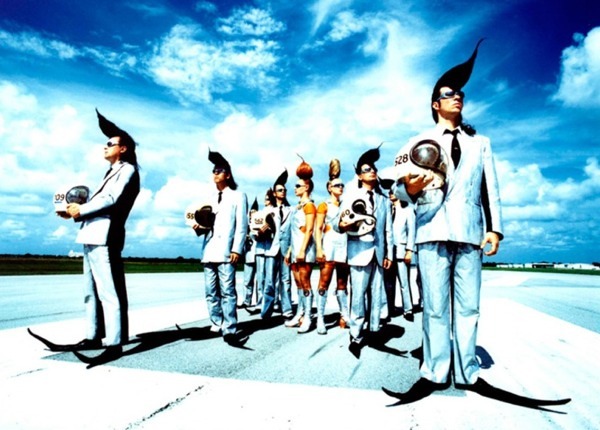 Initially a little more than a joke from the minds of director Aki Kaurismäki and members of the long running novelty rock band Sleepy Sleepers, they developed into a full ensemble playing everything from punk to polka with latin flavors and metal licks, usually within the same song. 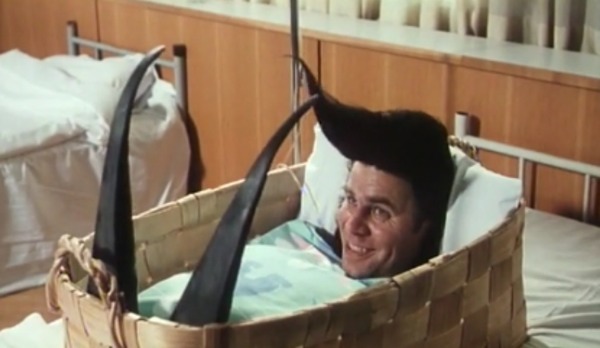 At some point it was inevitable a rendition of the Nancy Sinatra classic "These Boots Are Made For Walking" and subsequent video directed by Kaurismäki. "apparently caused by rivalries between youths from ranches surrounding Matehuala, a city of eighty thousand inhabitants in north-central Mexico. 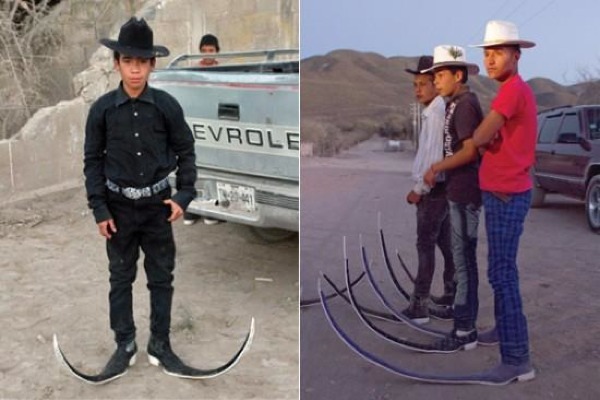 In such rural towns “there has always been a tendency to compete over who has the best pickup trucks, hats, and now boots,” a San Luis Potosí interviewee in Texas explained." From there the boots found their way into dance clubs and rodeo dance floors. They are now called Guarechero and the Mexicans - some of them at least - think they have invented it. We follow the fashion trend of the pointy boots. They were invented here. The've been around for about a year. I think this fashion started with the music. 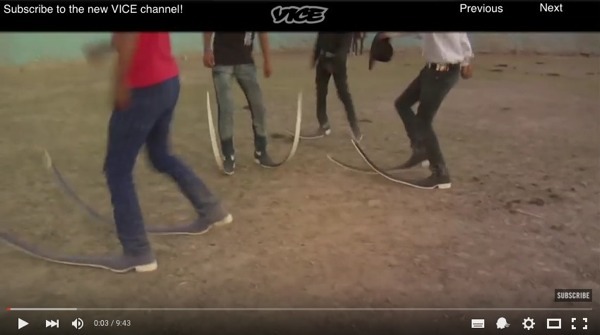 Tribal music brought the pointy boots. In the beginning, people were using regular boots. Then people started making them pointier and pointier, until it got out of control. 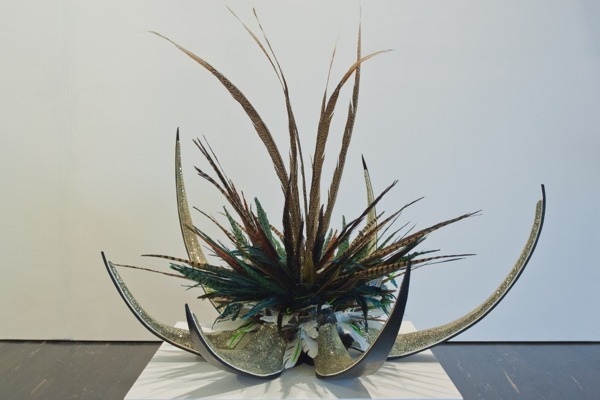 Her piece “Terrestrial”, a sculpture made of feathers and pointy boots that resembles an agave plant, was part of the 2013 MexiCali Biennial in Los Angeles and Mexicali that understands itself as a dynamic platform for creating new channels of communication between artists and audiences in the United States and Mexico.